Home builders throughout the U.S. have seen stratospheric price increases on steel, aluminum, lumber and other core housing materials this summer due to tariffs imposed by the Trump administration, and experts say the industry is bracing for continued pain, as the president appears likely to move forward with a proposed tax on at least $200 billion worth of goods imported from China. The tariffs put in place this spring on materials like steel and aluminum—the result of President Donald Trump’s hardline stance on international trade—have already added roughly $9,000 to the build cost of a new home, based on an average U.S. home price of $285,000, said Jerry Howard, CEO of the National Association of Home Builders. The Washington, D.C.-based organization represents more than 140,000 homebuilders and other industry workers. While the luxury housing sector is certainly not excluded from that impact, it has felt the pain somewhat less than the general housing market, experts said, since materials like nails and concrete are a smaller percentage of the overall cost of a luxury project. “People who are at that end of the market and are buying homes in that price point, they obviously negotiate and get the best pricing they can, but it’s really about what they want and their willingness to pay, and so the market doesn’t get as affected by it,” Mr. Howard said. Indeed, wealthy buyers’ demand for luxury housing in the U.S. remains strong, despite a slowdown forecast in the broader housing market. In California, demand is especially robust from international buyers looking to diversify their assets and newly minted millionaires working in the tech industry. According to Dan Dunmoyer, president and CEO of the California Building Industry Association, the tariffs have added roughly $10,000 to the cost of each steel and lumber required to build an average California home, which he defined as having four bedrooms and two bathrooms. While the taxes on imported steel and lumber combined may add up to $20,000, bumping the cost of building an average home by 5% or 6%, Mr. Dunmoyer said, it increases a typical luxury project in California by just 1% or 2%. Where the tariffs have hit home in the luxury market is in design details, particularly in multi-family dwellings. Since the Trump administration imposed 25% tariffs on steel and 10% tariffs on aluminum from Europe, Canada and Mexico in June, developers’ willingness to include lavish details, like exterior metal siding, has appeared to wane, said Peggy Marker, president of Marker Construction Group in Fort Lauderdale, Florida. The company builds custom homes and penthouses that cost between $5 million and $50 million, in addition to commercial construction. 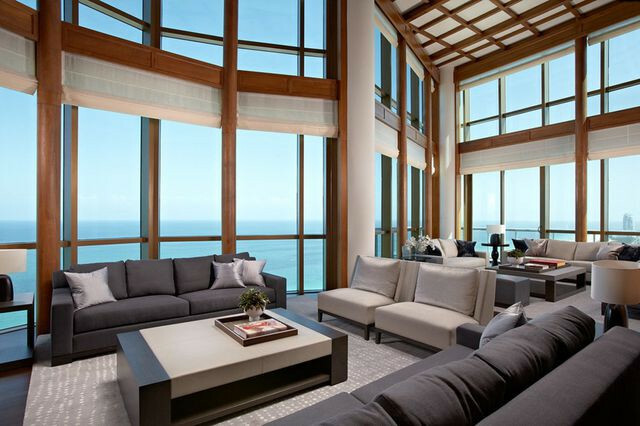 Interior of a luxury home in Fort Lauderdale area of Florida that was built by Marker Construction Group. “In the past, where you might have had a lot of decorative metal on the outside of the house, particularly railings or metal screens, that kind of thing, they’re changing that to other [materials],” she said, including glass, stone and imitation wood. The fluctuating prices of raw materials have forced some undesirable and inconvenient tweaks to design plans late in the building process, Ms. Marker said. Balconies, for one—those most ubiquitous features of Florida homes—have presented some of the biggest issues. Developers of a condominium tower that Ms. Marker’s company is working on redesigned the balconies after the tariffs took effect, she said. Plans call for 72 units listed for sale from about $2 million each, and a small change in the shape of the decorative metal on the balconies—from wavy lines to straight lines—made a significant difference on the developer’s bottom line, she said, though it didn’t affect the listing price. “It’s all those things that never came into play before that are now really being put down on paper to figure out where the bottom line is,” Ms. Marker said. As the trade war escalated this year, Ms. Marker said the subcontractors her company employs began reporting that price estimates for materials such as steel, concrete and even mechanical and engineering systems are reliable for only two weeks, rather than a couple of months, as is normal. Softwood lumber prices, meanwhile, initially soared upward of 60% higher than they’d been year over year, Mr. Howard said, after the Trump Administration imposed tariffs on timber from Canada, which supplies more than a quarter of what American builders use annually. Lumber prices have since settled down to about 23% higher than normal, he said. No matter how deep pocketed a homeowner or builder may be, the uncertainty around pricing can complicate the already tricky process of designing a custom home. Meanwhile, some interior materials favored by luxury homeowners—like quartz, marble and granite—could be the next to be hit with tariffs if Mr. Trump’s latest proposal is enacted. It would place import taxes between 10% to 25% on $200 billion worth of goods imported to the U.S. from China, pending a White House review of public comments submitted during a period that ended Thursday. Friday on Air Force One, President Trump told reporters that implementation “will take place very soon depending on what happens,” then threatened to place tariffs on an additional $267 billion worth of Chinese goods. Under the initial $200 billion proposal, consumer goods would be walloped, with the tax affecting everything from bicycles to textiles, along with raw materials used to manufacture window panes, countertops and light fixtures. Industry experts told Mansion Global they expect the economic impact on the industry overall to worsen before it gets better, especially amid the White House’s halting efforts to broker a new free trade agreement with Mexico and Canada. The post Trump Tariffs Have Hit U.S. Home Builders Hard, but Luxury Market Is Mostly Unscathed appeared first on Real Estate News & Insights | realtor.com®.